Dare I say our 125th season of musical impact and excellence was an epic one? A new LMC website was launched in May which gave us a whole, new world of flexibility, navigability, and inspiration to show how amazing LMC’s programs are. Included on the site are a number of videos, produced by our own PR team, that create instant impact and information about our programs, especially Music in Schools and The Frances Walton Competition. Classical KING FM 98.1 was our media sponsor this year. Our new LMC logo and collateral materials gave LMC a fresh, new look. We purchased and installed a Steinway B grand piano on January 13, 2016 to be on long-term loan to the Seattle Central Library. 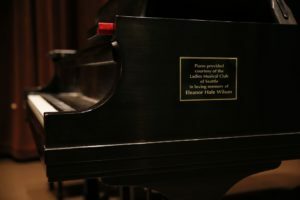 Our new piano was named for long-time member and benefactor, Eleanor Hale Wilson. The celebratory concert featured member pianists, as well as appreciative remarks from the Library staff. 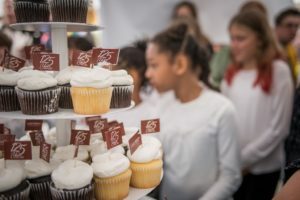 The Library promoted the event on their social media sites. Among the 57 concerts LMC presented on the Public Concerts Series, two special concerts in March celebrated the 125th anniversary of LMC’s first meeting and the 125th anniversary of LMC’s first concert. Works by LMC composers past and present were featured. This season saw more collaborative programming than ever before! Our PR team produced two beautiful new program covers featuring our work in the community and quasquicentennial history. and longtime advocate, Melinda Bargreen, serving as our special guest speaker. Competition winners Sophie Baird-Daniel, harpist, and Jovanni-Rey de Pedro, pianist, performed as well as describing their experiences on tour. Once again The Frances Walton Competition in June dazzled us with the talent of our competitors! For the first time a bassoonist was one of the solo winners, local talent, Dana Jackson. Music in Schools collaborated with FWC to bring two of the solo winners into Seattle schools for visits during the September 2016 tour. Finally, July 7th was a momentous day for LMC and the Museum of History and Industry! LMC celebrated its 125th Birthday Bash with two performances of an entertaining and informative program about our amazing history, featuring a number of LMC performers and guests representing our programs. 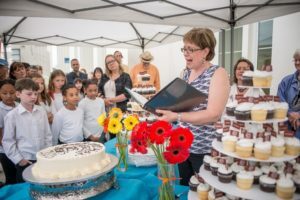 The City of Seattle and Mayor Ed Murray proclaimed July 7th Ladies Musical Club Day! Free birthday cupcakes were handed out to the crowds, and all seemed to have a truly joyous evening. MOHAI saw its largest July 7th attendance that day since 2013! I am continually amazed at the commitment and tireless work of the members of LMC. I look forward to continuing the development of LMC’s great work in the 2016-17 season!